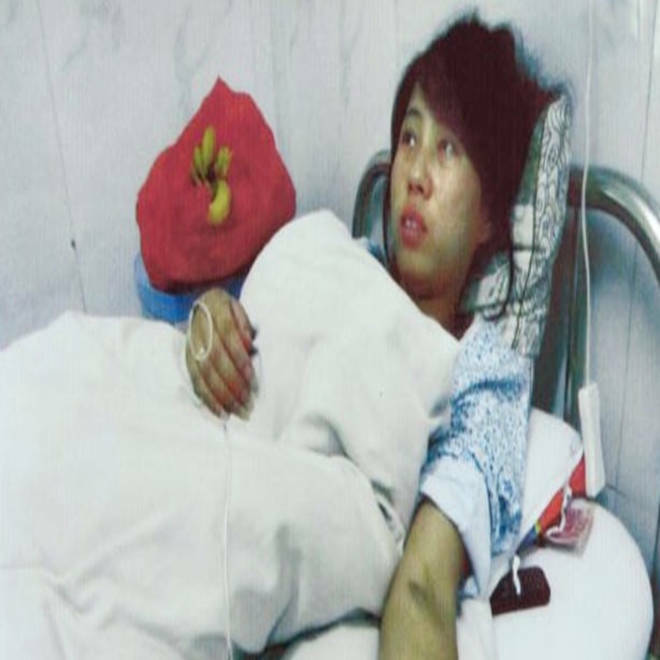 Photos of Feng Jianmei on her hospital bed after a forced abortion have been circulating on the web. The photos were taken by her sister who in turn contacted the media about the story. The photos originally appeared in a local newspaper report online and then they were picked by netizens and distributed online. Updated at 10:33 p.m. ET: China state media says city officials have apologized to Feng Jiamei and suspended three officials, the BBC reported. Xinhua news said the Ankang city government will urge the county government to review its family planning operations, according to the BBC report. BEIJING – Feng Jianmei says she was manhandled by seven people, some of them local family planning officials, some of whom she didn’t know. Feng, 22 years old and seven months pregnant, was dragged out of her relative’s home, carried and shoved into a van that headed straight to a hospital on June 2, she told NBC News in phone interview. She was blindfolded, thrown on a bed, and forced to sign a document that she couldn’t read with the blindfold still on her eyes. Then two shots were injected into her belly. Thirty hours later, on the morning June 4, she gave birth to a dead baby girl. Feng is one of the many Chinese women who have been forced to have abortions under China’s strict one-child-only policy started in late 1970s to contain the country’s fast growing population, which has now topped 1.3 billion people. China’s long time Communist leader Chairman Mao Zedong originally encouraged women to have as many children as possible during the Cold War-era when human power was believed to be an important force if war broke out. But the country’s rulers soon found it too difficult to feed the huge population – so they adopted a harsh policy that allows urban citizens to have only one child, and rural couples to have two, if the first child is a girl. The policy has been carried out for more than three decades despite public opposition, from human rights activists to ordinary people. Thousands of years of Chinese culture fostered the belief that “more children is more blessing,” especially in remote and rural areas where the elderly lack adequate social benefits and depend on children as they grow old. Government family planning officials are also under pressure to make sure their constituencies follow the quota of babies allowed. When there’s no clear law telling them what they can and cannot do, forced abortions, often on late-terms pregnancies, have become the norm, particularly for the poor who are unable to pay the hefty fines to have additional children. Advocates on behalf of these women are usually ignored or face government repression. For example, Chen Guangcheng, the famous blind lawyer and human rights activist, represented victims of family planning abuse in Shandong Province. Chen was jailed for four years for his advocacy and put under house arrest until he recently escaped illegal detainment and fled to the U.S. last month. There are no official figures of how many women in China unwillingly terminate pregnancies every year. “All Girls Allowed,” an organized founded by former 1989 student protest leader Chai Ling, claims there are 1.3 million forced abortions annually. Feng Jianmei didn’t realize she wasn’t allowed to have a second child (her first daughter was born in 2007) since everyone else around her was permitted to have a second child. Both she and her husband Deng Jiyuan took for granted that they would have the same right. But the family planning office in Zengjiazhen, a small town in Shaanxi province in the heart of China, thought differently. Through a rigorous and rigid household registration system designed to control population movement, the central government classifies all its citizens as either city dwellers or rural peasants. The registration, also known in Chinese as hukou, determines not only a citizen’s residence but also what kind of social services individuals are eligible for. It is very difficult to change one’s hukou although there are many ways, including marrying a person with a different registration status, applying for a new status through one’s job, or paying an enormous sum of money. The local family planning office decided that Feng wasn’t allowed to have a second child because she didn’t have the necessary permit – apparently she had failed to relocate her hukou to Zengjiazhen when she moved from her original province of Inner Mongolia. But the couple says they had no idea their plan to have a second child was connected with Feng’s hukou. They were given another option that would solve the problem: pay a fine of $6,400. But that was an impossible amount for the couple to afford – Deng is a migrant worker and Feng is a farmer. Feng’s sister received the same warning; if they couldn’t afford to help pay the fine, it was only a matter of time before her sister had to get rid of the baby, whether she wanted to or not. Things came to a head on June 2, but according to the local government, Feng agreed to the abortion. She sobbed when asked what happened next, and said she was too upset to think about it. She said all those officials who kidnapped her disappeared after the abortion, and she’s still suffering from a constant headache. Two appalling photos of her were taken and posted online that show her lying in bed, looking weak and helpless, with a dead and bloody baby next to her. The photos were taken by her sister who in turn contacted the media about the story. The photos originally appeared in a local newspaper report online and then they were picked by netizens and distributed online. Forced abortions in China are not new, but Feng’s story spread rapidly via social media, and outrage was immediate and unanimous. On Weibo, China’s Twitter-like microblogging site, netizens left thousands of angry comments, although many of the posts were quickly deleted by government censors. Zhao Chu, another writer, called it pure murder. “This is not about enforcing the policy, it is about depriving someone’s right to live. We avoid the nature of it by using a medical word ‘enforced abortion.’ For so long family planning seems like something completely irrelevant of human life. It’s like coal mining or digging mushrooms. Human life has become lifeless indexes, some cold, meaningless numbers. “Also, pushed by heavy fines, the controversial policy has become profit-oriented activities that everyone hates. The worst victims are those of low-class rural people who have no power to fight. Their tears and cries are not heard by so called mainstream society and the victims become worse than the untouchables,” said Zhao. Many called for the one-child policy to be outlawed. “We feel so sorry for the dead baby girl, we criticize those so-called law enforcers. But we should rethink the 30-year-long family planning policy. It’d be worth it if this could help to change the policy! We keep our eyes open!” commented user A-Kun on his Weibo page. Even Hu Xijin, chief editor of Global Times, one of China’s most pro-government newspapers, criticized the forced abortion on his Weibo account. “I strongly oppose the barbarous forced abortion to this 7-month-pregnant mother. Time has changed and the intensity of enforcing family planning has changed. We should promote civilized family planning,” Hu wrote. NBC News tried to contact both town and city level family planning offices in Zengjiazhen and Ankang, but the calls went unanswered. A report from Xinhua, China’s official government news agency, released on Thursday said that the Shaanxi Provincial Family Planning Committee has sent an investigation team to Zengjiazhen and requested local government to have the responsible parties held accountable. “This has damaged the image of family planning work, and had an adverse effect on the society. The committee will resolutely prevent such things from happening again,” the Xinhua news report said. Feng’s conversation with NBC News was interrupted three times by what she said were government cadres entering her hospital ward to talk.